Want to level-up your Drift Profile? Here's how to get more. Buffer Time: This is the amount of time that must be empty on your calendar in order for a next meeting to be booked to make sure that you have time in case calls run late. For example, if your buffer time is 15 minutes, that means if you have a meeting from 2:00 - 2:30, the next available meeting that somebody can book on your calendar will be 2:45. Minimum Notice Time: This is the minimum amount of time that it needs to be from now (the moment somebody is trying to book you) before somebody can book a next meeting with you. For example, if your minimum notice time is 30 minutes and it's currently 2:53pm, the next available slot will be for 3:30pm so that somebody doesn't book you at 3pm and you have time to prepare for the call. We STRONGLY recommend setting your URLs once at the beginning of your profile setup and never touching them again. 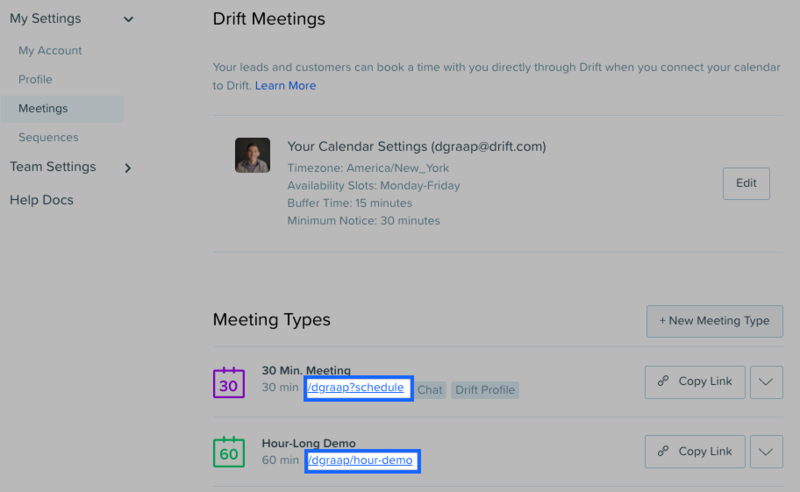 Through the Widget API, you can make a link or button anywhere on your site open up the scheduling flow via Drift. You'll want to use the api.scheduleMeeting(driftUserId); method. You'll need to ask us for your Drift User ID to pick which calendar to trigger. Just ask us and we'll gladly provide it! Sharing a direct link that automatically triggers the scheduling flow. You can add ?schedule or another custom link for a different meeting type to the end of your profile URL and going to that link will automatically open a new conversation with the bot asking the visitor to book a meeting with you. By default, all of the colors on this page match the styling colors of your widget. Go here to update those. By default, all profiles will have Drift branding in the corners of the page. If you're on the Pro Plan or up, you can remove all branding on your styling settings page. At the moment, all campaigns are disabled on these pages to make sure that only your team member's face ever displays on their profile page. Let us know if you disagree with our decision to do that. If anybody starts a conversation on one of these profiles, the conversation will automatically be assigned to that person whose page it is. You'll also see in the source URL at the start of a conversation that the visitor is starting a conversation from a profile page. There is one Drift Bot flow that is disabled on all profile pages, which is the flow where it asks the visitor who they'd like to talk to. Obviously, they want to talk to the person whose profile they're on!